Health is surely the biggest wealth. 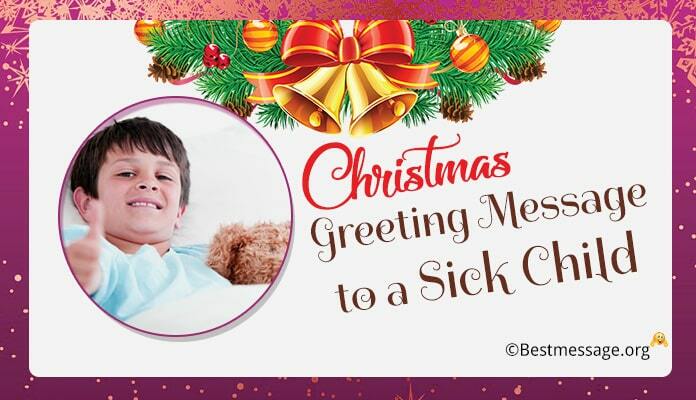 At Christmas time, if there is a sick child around you, send him Xmas greetings that make him feel better. Share with them funny Merry Christmas wishes for grandchildren and Christmas card messages that can make them smile. Make sure you send beautiful Christmas messages for children’s card to make it a merrier occasion for them. Enjoy the collection of inspirational Christmas quotes for a sick child. With these sample Christmas messages for sick kids, wish them with lots of love. 1). Nothing is impossible in this world, all you need is hope and determination….. Wishing you a Merry Christmas and a New Year blessed with good health. 2). You can be sick only if you feel you are sick…. The best way to live life is to forget your illness and enjoy Christmas and hoping for happy and healthy times…. Merry Christmas. 3). On the occasion of Christmas, I pray to God to bless you with the best of health so that you can enjoy Christmas with more joy and smiles on your face. 4). The beauty of Christmas lies in your smile….. On this festive occasion, forget that you are sick and just enjoy the merriment of Xmas….. Merry Christmas to you!!!! 5). I wish that Santa gives you a gift of good health and strength so that you can enjoy the holiday season and have a health year ahead….. Merry Christmas!!! 6). Being sick is just a condition and you must just let the time pass…. Don’t forget to create new memories this Christmas because it is special in its own way. 7). Good and bad phases are a part of life and festivities are the way to bring back the lost hope and enjoy life…. Sending you warm Christmas wishes with lots of love. 8). My only wish on Christmas is to see you as healthy as a horse as we enter the New Year…. Wishing you Merry Christmas and a speedy recovery!! !